A startup that plans to use high-altitude balloons to deploy rockets has successfully fired a test launch, moving closer to its goal of helping end the backlog of microsatellites that wait months or longer to "hitch" a ride on larger rockets. 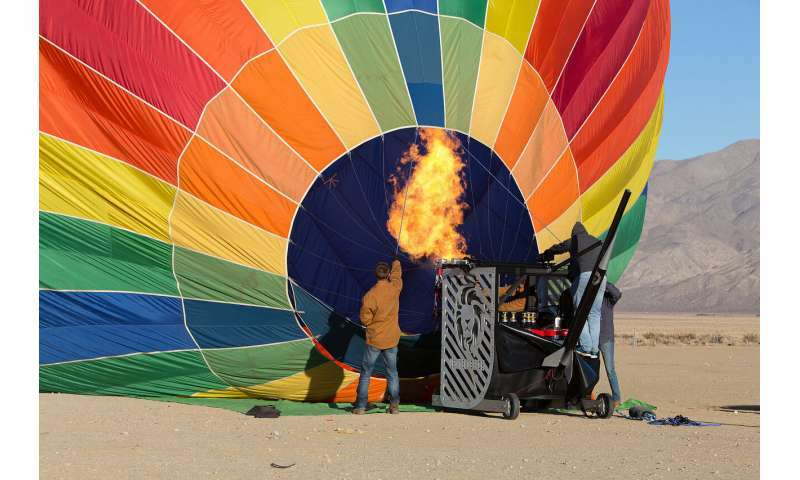 Leo Aerospace LLC, a Purdue University-affiliated startup based in Los Angeles, launched its first "rockoon," a high-power rocket from a reusable balloon platform, from the Mojave Desert in southern California in December. "It was thrilling to see that first launch after all those months of hard work and planning," said Michael Hepfer, head of product development for Leo Aerospace and a senior in Purdue's School of Industrial Engineering. "It confirmed our early testing that using high-altitude balloons and rockets to send microsatellites into space will work." Leo Aerospace aims to revolutionize access to space for those looking to launch small satellites about the size of toasters, weighing up to 25 kilograms, or about 110 pounds. It plans to be a "dedicated" launch for microsatellites, serving one customer at a time. SpaceWorks Enterprises Inc. issued a report last year estimating that as many as 2,600 nanosatellites or microsatellites will be launched over the next five years. To accomplish this, more companies that can send the satellites into space are needed. "We at Leo believe it should be as easy to put a microsatellite into space as it is to ship a package across the country," said Dane Rudy, the company's chief executive officer and a graduate of Purdue's School of Mechanical Engineering. "There will be no more need for ridesharing or hitchhiking." Large aerospace launch companies generally cater more to large satellite companies, leaving microsatellite companies to wait to see if there is any leftover space available, and the microsatellite operators must try to find rockets that will deploy their equipment somewhere in the vicinity of where they would like. Even then, it can take months to maneuver into place after already waiting for months to be deployed. "It's like taking a bus compared to taking an Uber," Hepfer said. "With us, you're our only customer, so we'll take you wherever you want to be." Hepfer said the advantage Leo Aerospace will have over larger companies is that its clients will be the microsatellite companies and they will be able to deploy to precise locations. Using the high-altitude balloon as a launch pad will save money because it will deploy the rocket from up to 11 miles into the atmosphere. At that altitude, there is 95 percent less atmosphere, meaning there is much less drag. That means Leo Aerospace can use smaller rockets and less fuel. Leo Aerospace already has begun taking letters of intent from microsatellite companies. Hepfer said the company doesn't plan to start selling launches until it is ready to begin launches. Leo plans to begin doing suborbital launches next year and break the edge of space by 2021. Suborbital launches allow scientists to gather information about the atmosphere and other research data. The goal is to be able to start launching microsatellites into orbit by 2022. Those microsatellites will be able to monitor the health of crops, to track global commodity supplies and to advance scientific exploration. "The number of ways the microsatellites are being used just keeps growing," Hepfer said. The microsatellites typically don't stay in orbit as long as larger satellites, typically staying in orbit one to five years. That means the possibility of return business, Hepfer said. "Because we could have customers coming back every five years," he said, "it also motivates microsatellite companies to look for launch vehicles that will give them the highest value." Hepfer said the launch in December, which did not include deploying a satellite, provided Leo Aerospace with valuable data. "We got some great information about what happens to the balloon craft when the rocket is launching because it shakes, vibrates, and twists. So next time we launch a bigger rocket we know what changes need to be made beforehand. Every time we do this we learn how to make it better for the next one," he said. The team members say they've learned a lot about how to run a business and how to launch a rocket and hit every milestone they set on target. "The big challenge was figuring out how to integrate a high-altitude balloon with the logistics of attaching a rocket to it and then launching it remotely," Hepfer said. "A big part of that was automating a lot of the systems because the balloon is going to be out of sight when the rocket is launched." With the test launch completed, the startup founders are now planning to move on to their next phase, which involves raising $8 million to fund the company for the next two years. They also are looking to add personnel, including a vice president for business development and vice president of engineering. They are looking for people experienced in the aerospace industry who can bring valuable aerospace know-how. The team spent two months in Australia last summer taking part in Startmate, an accelerator program, and plans to conduct at least some of its launches Down Under. Leo Aerospace's long-term business plan includes doing a number of launches from Australia because regulations and air traffic can allow companies to fly more frequently, Hepfer said.